Familiarize yourself with current law changes for Florida commercial driver’s license holders. §48.03, Florida Statutes: Adds civil traffic cases to the types of court cases for which service of process may be made on a witness by US mail. §119.0712, Florida Statutes: Customer e-mail addresses collected by the DHSMV while conducting driver license and motor vehicle record transactions are exempt from the state’s public records laws. 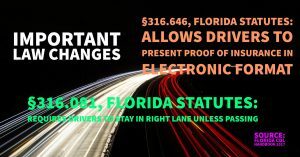 §316.081, Florida Statutes: Requires drivers to stay in right lane unless passing. §316.1937, §322.2715, Florida Statutes: The breath levels for the Ignition Interlock Device was lowered from 0.05 to 0.025. §316.302, §316.3025, Florida Statutes: Includes the prohibition of handheld communications device usage in the operation of commercial motor vehicles (CMV) and prescribes specific fines for such violations. First offense is $500.00 for driver and $2750 for company. An emergency exemption is also provided in event of a declared emergency. §316.515, Florida Statutes: Allows attaching a forklift to the rear of the bed of a straight truck as long as the overall combined length does not exceed 50 feet. §316.646, Florida Statutes: Allows drivers to present proof of insurance in an electronic format. §318.18, Florida Statutes: Increases the fine from $100 to $500 for a violation of unlawfully displaying vehicles for sale, hire, or rental. §322.051, 322.08, 322.14, Florida Statutes: Provides for DHSMV to accept military identification cards to meet certain requirements for issuance of a driver license or identification card. §322.08,Florida Statutes: Requires DHSMV, and their authorized agents, to provide each applicant for a driver license the option to register emergency contact information and the option to be contacted with information about state and federal benefits available as a result of military service. §322.143, Florida Statutes: Establishes when a private entity may swipe a driver license or identification card and how the information may be used. Also establishes a civil penalty. §322.212, Florida Statutes: Requires a one-year commercial motor vehicle disqualification for providing false information or for test fraud in connection with either a commercial driver license or commercial learner permit application. This one-year disqualification period is required by federal rule 49 CFR 383.73(k)(1). §322.61, Florida Statutes, 49 CFR 383.5: Subjects CLP holders to the same traffic violation criteria that now disqualify CDL holders from operating CMVs, as required by the federal code.